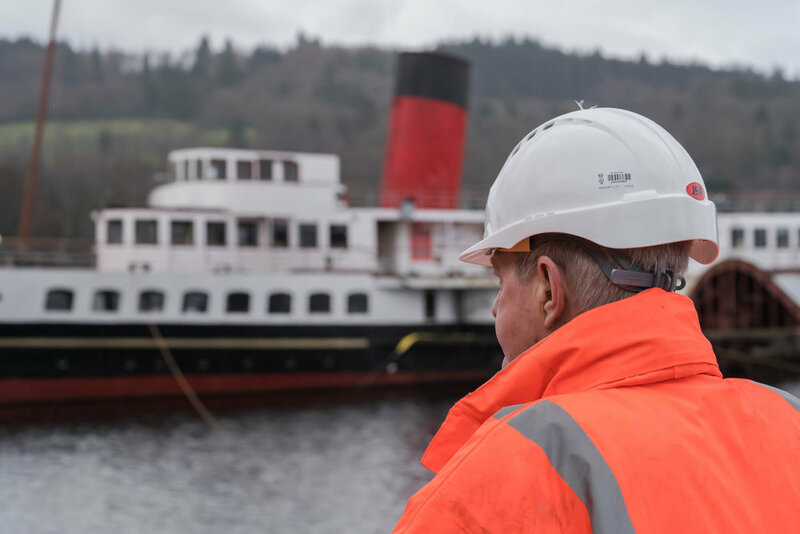 We have watched first hand the hard work and dedication that the volunteers of the Loch Lomond Steamship Company have put in over the years to preserve and restore the Maid of the Loch. The Maid was Loch Lomond’s last paddle steamer and since the 1980’s has been static, moored close to Loch Lomond Shores. The ship is popular with visitors to Loch Lomond, open in summer months for guided tours. There is also a tea room on board. 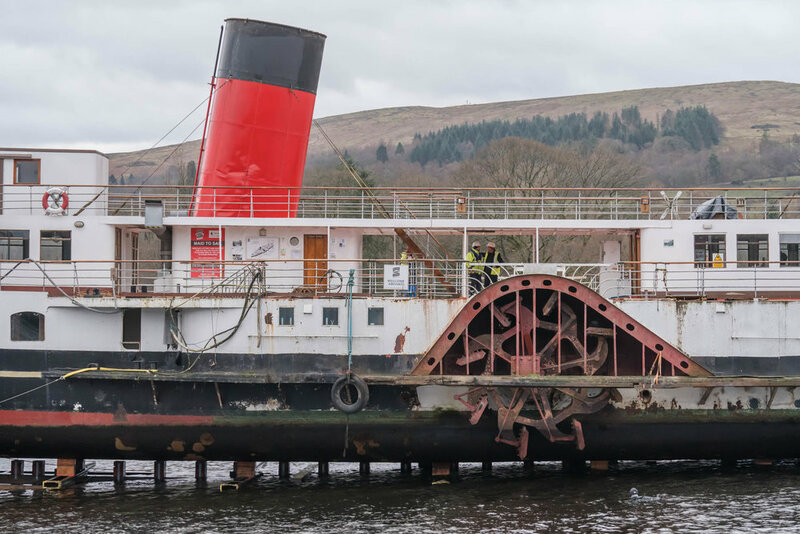 My marketing company produced the DVD that told the story of the Maid of the Loch, from the last years of the golden age of steam, to a period of neglect, rescue and then the on-going hard work to restore her as a serving cruise boat on Loch Lomond. We also produced Crowd Funding Videos to promote the recent appeal to raise some of the funds required to get the boat sailing again. Funds are needs to install a boiler and to get her to the standards where she is compliant to carry passengers again. Today was another of those significant dates in the rollercoaster story of the Maid of The Loch. This was a day, only the second in 40 years, for her to be slipped. The plan was to pull her away from her berth, carefully lining her up with the nearby dry dock area. Then she was to be slowly winched out using the steam winch house. Once fully out of the water the Maid could then be inspected, cleaned with some repairs, before being returned back to her usual berth. I am grateful to the charity for allowing me the opportunity to photograph and video the operation. I was not alone though as there were many press photographers, time lapse cameras, TV news camera crews, reporters and drones to record every angle of the occasion. The access points that I was allowed to use provided some brilliant views of the Maid in open water. Also present were many members of the public who came along to watch. Some who had fond memories of sailing on her. Sadly despite the great effort of getting the Maid out of the loch and onto the slipway the winch snapped and the Maid returned back into Loch Lomond. Whilst this is was a significant disappointment for the charity, everyone was safe and the Maid tonight is securely back in her usual berth. As usual all of the charity directors and volunteers were working incredibly hard today and we wish them well with their next steps. They have come a long way in recent years and have experienced a mixture of successes and disappointments with funding applications. What does seem to be constant though is both their determination and the considerable level of public support towards getting The Maid of the Loch sailing again. The Maid left her berth today at 10.33 and returned again at 13.58. Here are some of my photographs, taken over the nearly 3.5 hours in between. Thank you for subscribing, we will send you an e-mail shortly to confirm your subscription. If you don’t receive it please check your spam folder.